Yes, we aren’t dead, and we also haven’t run off with the Kickstarter money to buy a mid-size luxury sedan and drive straight across the Mexican border. Though that certainly would have been a hell of a lot cheaper in the long run anyway. Here we are, Waynesaw is out!! 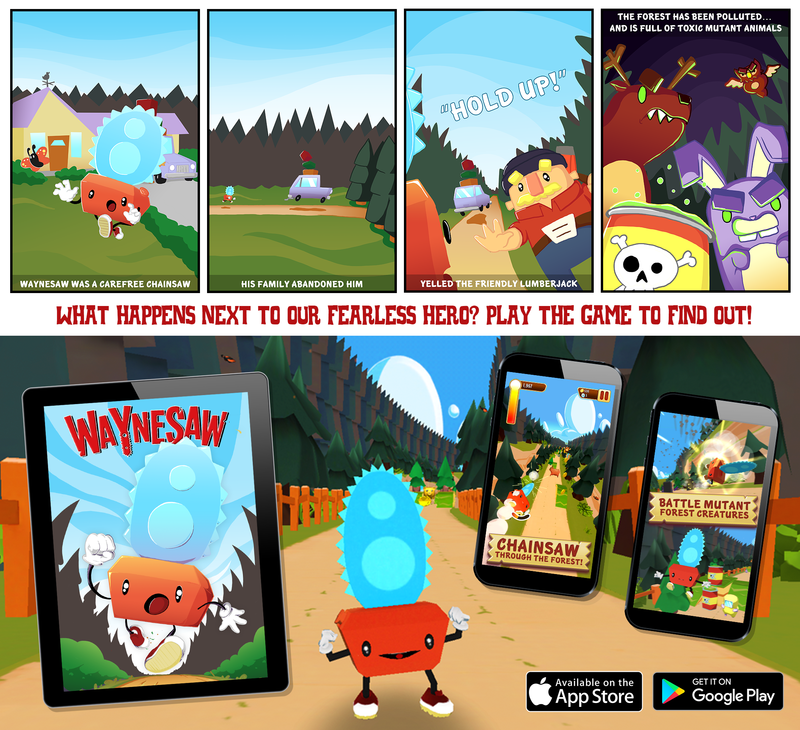 Finally, you can delete every single other app on your phone because you can now go the iOS App Store or Android Google Play and download Waynesaw for free. If you buy anything in the game, we’ll be donating a chunk of that to support US National Parks. It was the least we could do after making a game about a chainsaw leveling a forest. We hope you enjoy the game! Leave a nice review in the app store if you like it, and if you hate it, we recommend keeping your goddamn mouth shut and downloading Crossy Road. What’s next for us? Who knows. Now that the game is out, it’s a tremendous load of pressure off our shoulders. We’ll be monitoring and patching the game as needed, but in the meantime keep an eye here for any updates. And we can’t say it enough: THANK YOU for supporting ASP for all these years with your eyeballs. ASP Book – Look At It, Look. Q: So, uh, what is this thing exactly? A: It’s a “book,” which is a physical collection of data, predating the internet by nearly 100 years! Q: What’s in the book? A: It’s the first ever collection of ASP comics! 180+ handpicked comics from January 2009 to February 2011. Q: What if my favorite strip is before January 2009 or after February 2011? A: For our first book we feel like this selection is our “best foot forward.” Plus, if this book does well enough, we’ll likely print an “ASP Classics” book in the future. Q: Why should I buy this thing? All of the comics are already on the internet. Q: But seriously, what’s so special about it? A: Well, not only does it have a hefty dose of comics, but there are 14+ pages of never-before-seen bonus content that Wes and Tony put together solely for the production of this book. So that’s a start! Q: Bonus content? Like what? A: Stuff like behind-the-scenes materials, detailed concept sketches, and rejected comics! Q: What about alt texts and the hidden comics? A: …what hidden comics? 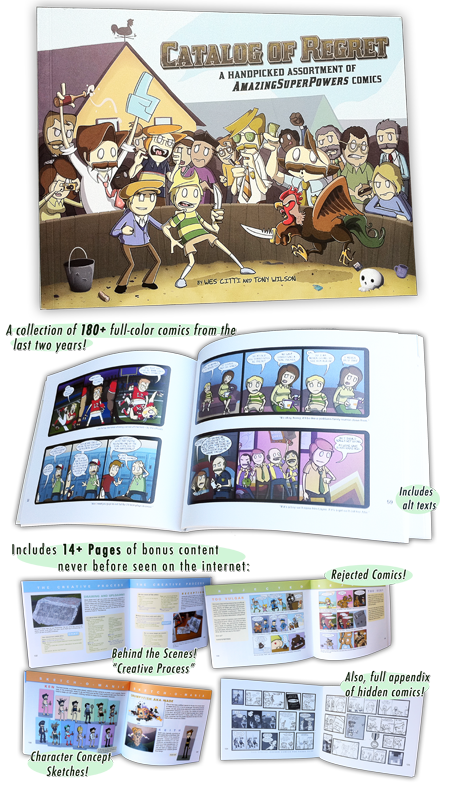 But yes, the alt texts are all in there, including an appendix for the hidden comics. So it’s pretty damn complete. Q: Plus it’s a good way to support you guys, right? A: Sure. Good point. Thanks? Q: Also I was thinking this would make a pretty good gift, too. You can basically open to a random page of this thing and be entertained. A: That’s true. Yeah. Cool. Q: And the cover looks great. Q: Awesome! So how much does it cost and how do I order this thing? A: Uh, it’s $18 plus shipping, and if you want a signed copy with a custom message and sketch in there, that’s only $6 more (!) Check out the link below to Topatoco for order details! Here’s a little sampling of ASP Shorts we’ve made! Subscribe to our YouTube channel to stay in the loop for more to come! You can browse all of the shorts on the ASP Shorts page!